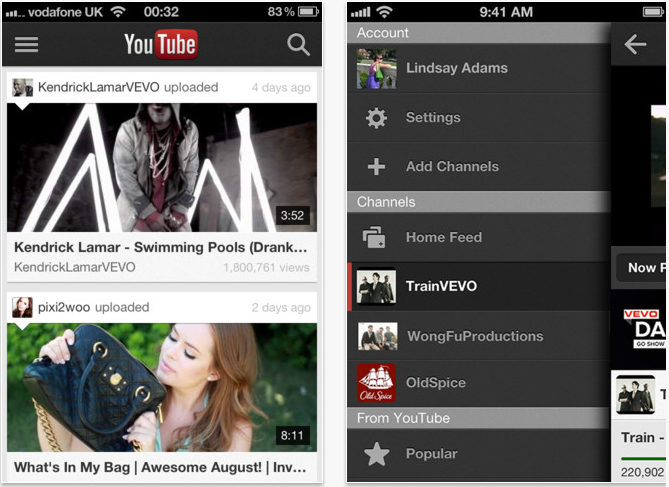 Just one day before the official iPhone 5 and iOS 6 launch announcements, Google has rolled out its new and improved YouTube app for iPhone and iPod touch. A left side panel that includes a channel guide, subscribed channels, and other video content can be accessed by swiping the left side of the the screen. Share functionality that integrates with iOS has been added, as has the ability to view comments while watching a video. Search has been updated with an auto-complete feature that will suggest similar videos as you type in your search query. And tens of thousands of official music videos, a significant change that indicates that YouTube has finally integrated ads onto the new iOS app. YouTube has been a long-time partner with Apple, providing Google with real estate on all iOS devices for a native YouTube app that sat front and center on the front page of Apple’s mobile devices. When the licensing period ended and Apple decided to part ways, Google confirmed that YouTube would be absent from iOS 6 devices. Mobile usage of the YouTube app on iOS devices could dip slightly due to the lack of a pre-installed YouTube app on iOS devices. Currently, as much as 25 percent of total YouTube views come from its mobile apps, which equates to a whopping 1 billion daily mobile views. While the change may be bad for Google, it seems like a win for users. YouTube’s native app was noticeably neglected by Apple. Under the terms of the partnership, Apple was responsible for designing the app in the first place based on YouTube guidelines. So the infrequent updates and outdated user interface were Apple’s fault, not Google’s. While YouTube lost valuable real estate and Google scrambled to design a standalone iPhone app in preparation for the iOS 6 release, Google is finally free from Apple’s regulations, and we can expect regular updates Google develops a product that provides a superior user experience for its users. For now, the app will be available for the iPhone and iPod touch only, but YouTube has confirmed that its team is working on an optimized version for the iPad, which will debut in a few months. The app was released internationally beginning today, and it can be downloaded here. Apple Arcade will reportedly be supported by investments worth more than $500 million. Apple is also said to be offering incentives to developers if they decide to release their games as mobile exclusives for Apple Arcade. Apple will release a fully wireless pair of earphones in May from its Beats brand. The Powerbeats Pro earphones have impressive features to compete with the AirPods, along with a litany of other options. Here's everything we know. iOS 12 was a relatively large update to Apple's iPhone, but iOS 13 could be even bigger. Rumors have begun circulating about what we should expect from iOS 13, which suggest a much more productive operating system for both iPhone and iPad. Apple has a bizarre issue with its second-generation Pencil. The company says that if it's in charging mode and is positioned close to a car's key fob, interference can prevent the device from unlocking the vehicle. Apple and Qualcomm have announced that they have settled all disputes between them around the world -- and not only that, but have also agreed to a six-year agreement for Qualcomm to supply Apple with chips.